Since November 17, the “yellow vests” [gilets jaunes] have brought the people back to the fore, revealing the extent of the democratic crisis. An unprecedented mobilization has brought a halt to Emmanuel Macron’s five-year term. Emmanuel Macron loves, decidedly, the small Norman villages. Before debating for seven hours in a gymnasium in Grand-Bourgtheroulde on Tuesday, he made a stop at the Berd’huis, a small village in the Orne, in April 2018, for an appointment with Jean-Pierre Pernaut. This seems to come from another time. A year after his election, the president felt powerful. To the unions who were fighting against the transformation of the SNCF, he warned that he would go “to the end”. To the students who were fighting against Parcoursup’s selection logic, he was saying that they had better think again “There will be no chocolate exam in the Republic,” he added, from a grade 2 class. Shamelessly, he said “thank you” to retirees for losing income because of the rise of the CSG. “A lot of the way has been traveled but there is still much to do,” he said at that time. The capitalists could not fault him. For them, the assessment was already largely positive. The TFR on financial investments was crossed out with a stroke of the pen. The flat tax, an anglicism useful for concealing the end of the progressivity of taxation on capital, had just passed like a letter to the post office. In 2019, the Cice engraved in marble will make 40 billion euros for businesses. The difficulties? They “do not stop me and, I am not naive, I even expected them,” he declared, this president of the ultra-rich. He had not expected, obviously, that social anger would spring up around him, that the cry of greater fiscal justice would resound under the windows of the Elysee, where he was completely barricaded. Nor that this dispute would occur everywhere, far exceeding a few demonstrations at place de la Republic et Nation, and that it would flood the upscale streets of the capital. Nothing, indeed, will be like before. Because we have now seen the emergence of faces and figures that until now were invisible. 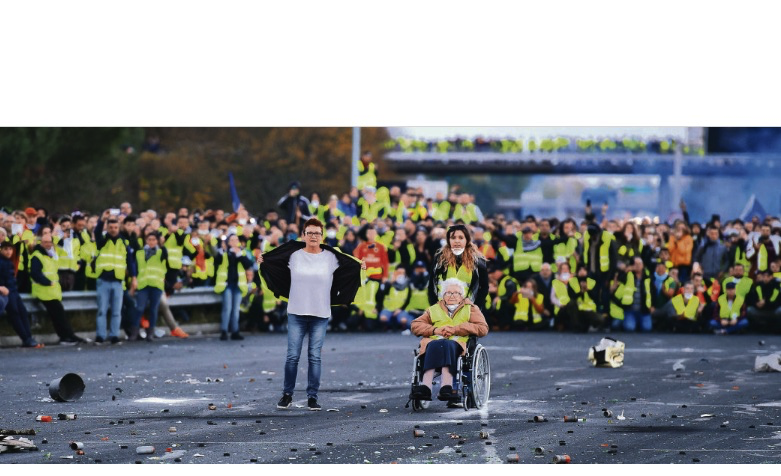 It was necessary to see, on the barricades and in the demonstrations, the yellow vests in the live interviews of the TV channel BFMTV to understand the satisfaction of ordinary people to finally be shown in the television news. There resurfaced a whole people that some people thought had been swallowed up forever in the “suburban nightmare,” a “pacified proletariat” succumbed to the cult of goods and property. A “closed session of the ego” where one would live “separated together” in a well-marked routine, far from the world of demonstrations and collective struggles. What is the future of the Gilets Jaunes movement? But this was not to be! Thousands of employees, workers and employees fraternized and demonstrated for the first time. This movement will leave traces at home, and not just because he was beaten by the police, during the act IV. This resident of Carrières-sous-Poissy (Yvelines), earning 1,700 euros per month, came out with a knee injury, a broken phone and the determination that he would not give up. “I was shocked, but I am passionate about this movement, this desire to find the right way to justice. As Macron has already repealed the carbon tax, we must continue. This political expression pushes him today to demand a change of Constitution, believing that the citizens’ initiative referendum (RIC) does not “go far enough”. Nothing will be as before, because this movement combines social and democratic demands.. . . This movement, although it has overflowed the big trade union centers, can not however be detached from the world of work, according to Benoît Coquart, sociologist at INRA. “I spoke with an employee of Amazon, when we met at the demonstration. she told how it is very difficult to organize, to make demands, in this company where there are many temporary workers and short-term contracts [interim]. But what they can no longer do in their workplace, these workers can do through this type of movement in the streets which, at first glance, takes place outside the world of work,” reports the researcher. “Macron will be on interim,” one could read on a wall in Dijon, between two slogans demanding the resignation of the head of state. Nothing will be as before, because, for the first time in a long time, the dominant classes were afraid of this “monster who escaped his parents”, these people “factious” and “seditious” (Christophe Castaner), this “hateful crowd” (Emmanuel Macron). But their repressive strategy was not enough to extinguish the demonstrations that continued between Christmas and the New Year. “This is perhaps the first social movement of the new global age, as defined by the sociologist Saskia Sassen. This is an age when states have voluntarily delegated some of their powers to the European Union or independent administrative agencies, removing them from the decision of the citizen,” according to Danielle Tartakovsky, historian and specialist social movements, speaking to Echoes. The great strength of this movement that has united under the clothing of “yellow vests” individuals from a very broad range of political views, could also become its weakness in the future. For the moment its claims are egalitarian and rather progressive, but it is still far from having the force to be inscribed in the long history of the labor movement. It remains to be seen what will happen with regard to institutional policy. In short, everything remains to be done if 2018 will enter permanently in the lineage of 1995, 1968, 1936 and 1789, as recently claimed by a sign of yellow vests.